The type of facility chosen must fulfill only the purpose and need of the corridor, no more and no less. The purpose and need of a highway corridor involves more than traffic volume alone. The desired operational level of service (LOS) of the highway is the factor that contributes the most weight and is to be used when selecting the facility type. The Peak Hour LOS for the 20-year traffic projection of a rural corridor should be D and its Off-Peak LOS should be C. The Peak Hour LOS for the 20-year traffic projection of an urban corridor should be E and its Off-Peak Hour LOS should be D. Planning Division will continue to identify the general types of facilities for statewide system continuity. The specific LOS of a facility is sometimes identified only after a subjective process, using traffic modeling software. In general, however, it is adequate for all routes in rural locations to accommodate the 20-year peak hour traffic at a LOS of D and off-peak traffic at a LOS of C. Similarly, it is adequate for all roads in urban or suburban locations to accommodate the 20-year peak hour traffic at a LOS of E, off-peak traffic at a LOS of D. Given these LOS targets, the designer will use the formulas given in the AASHTO Highway Capacity Manual, Highway Capacity Software or other traffic modeling software to determine the appropriate facility type. 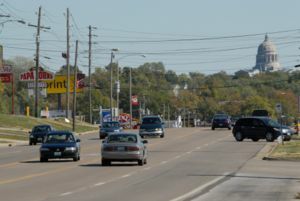 Some highway corridors in the state have a desired facility type for the entire corridor that has already been established by MoDOT’s Planning Division. This has been done to establish general system continuity within the state. For this reason, projects that lie within such corridors should conform to the established facility type, regardless of localized LOS computation. In general, highways serve two purposes: providing mobility and access. All highway corridors require some aspect of both access and mobility, although the relationship between the two is indirectly proportional. As the level of mobility of a facility increases, it’s ability to provide access decreases and vice versa. Great care must be taken to strike an operational balance between the two, based on the project purpose and need. Nationwide, a great deal of research has been done in the area of access management. 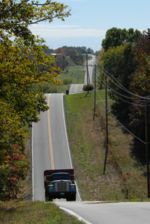 MoDOT’s Access Management Guidelines (AMG) were developed by tailoring this policy to the specific needs of Missouri’s highway system. The AMG must be used to provide the proper level of balance for individual projects. In most cases, an expressway should be designed wherever the designers’ calculations determine the need for a four-lane facility. Expressways are inherently safer than “head-to-head” facilities while allowing higher levels of access than freeways. The costs associated with expressways are also much lower given the lower number of interchanges required. Exceptions to this policy should be considered where safety and operational characteristics of the project dictate the need for a freeway. A freeway facility is mandated for the Interstate System. In the past, two way left turn lanes (TWLTL) have been viewed as operationally deficient. Within the context of a practical solution, however, this arrangement may provide legitimate access on projects and may be considered in certain locations. Two-way left-turn lanes (TWLTL) are permissible where practical. At times, a poor LOS can be attributed to a lack of passing opportunities and vehicle’s time spent following slower vehicles. In these situations, the highway’s performance can be greatly increased by providing dedicated passing opportunities. While there are many ways to accomplish this, the improvement is generically referred to as a “passing lane”. The improvement can be as simple as the addition of a climbing lane on a steep grade or as complex as a "shared 4-lane" (also known as 2+1) roadway that provides a continuous third lane to offer alternating passing opportunity to either direction of travel. 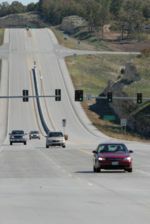 MoDOT has recently commissioned a study of passing lanes and has received the final report that will be published as engineering policy in the near future. In the interim, policy guidance on this issue will be furnished by request. Articles in "232 Facility Selection"
This page was last modified on 2 February 2016, at 09:31.